It's a new kind of wedding ceremony for this cute cartoon hamster couple. They are each writing their own funny wedding vows. "I like you pretty good. Let's see how it goes", says adorable Estherham. Finally, wedding vows that allow an idyllic hamster relationship to flourish. Isn't her veil lovely? It's definitely the perfect hamster wedding dress veil. It will be a very romantic hamster honeymoon. I hear they are camping in Malibu during the Malibu Hamster Annual Forage Festival. Oh, the lavishness of it all! These freedom seeking happily ever Abrahamsters know how to have fun. Send this cute and funny wedding vows hamster puzzle as a jiggy free ecard. 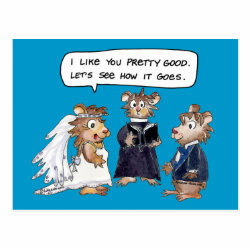 To purchase as a funny wedding vows cartoon hamster postcard which can personalized on front and back. Play funny cartoon pictures free jigsaw puzzles of this cute cartoon hamster 013 game. If you would like to vary the CUT OF THE PUZZLE click on the shapes button, you can alter the cutout jiggy shapes and change the difficulty of the puzzle to give yourself more of a challenge. Some of the cuts (shapes) are incredible! Very fun crazy ones. Some really hard! There is a built in timer if you want to test yourself (and or if you happen to also be cooking eggs) When you move the pieces with your mouse, listen for the CLICK as you release and you will hear when the piece locks into place. The timer starts when you click on a game.